Social Objects surveys recent work from members of the Socially Engaged Craft Collective, an expanding network of artists who create a wide range of socially engaged art projects that are rooted in the rich history of ceramic objects. By inviting use within the structure of the gallery, the exhibition confronts the current paradigm of the gallery and the pedestal. Each artist will use the gallery as a site to engage the viewer in touching, using, and experiencing ceramic works. The show will include objects, documentation, and participatory works that will take place during the exhibition. 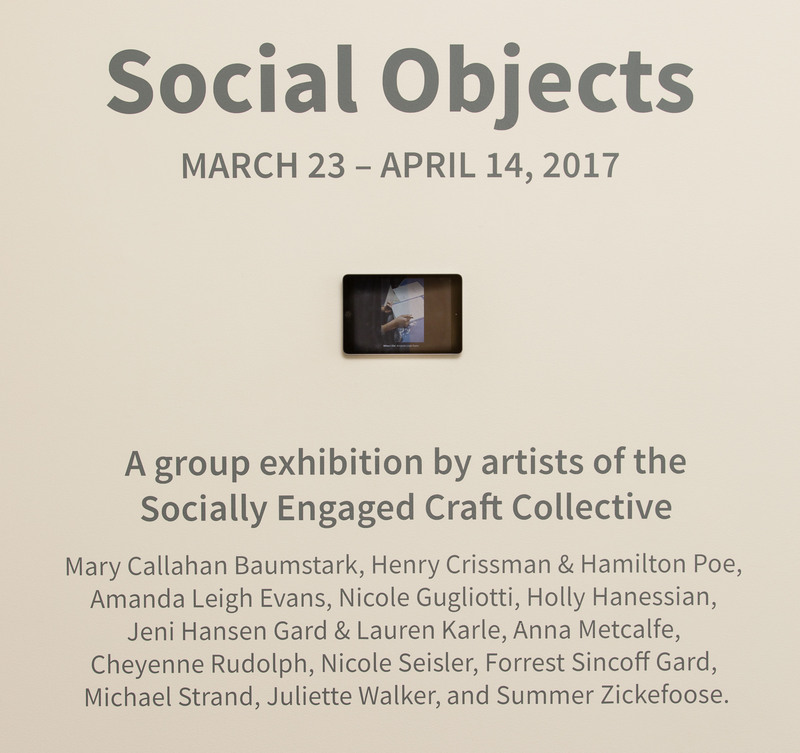 Social Objects aims to broaden the lens with which we commonly view art by showcasing projects that act as a catalyst for change and growing community. From meal sharing to interactive art, and performance to activism, the exhibition represents diversity within the ceramic field. Featuring individual projects from Jeni Hansen Gard, Forrest Sincoff Gard, Nicole Gugliotti, Cheyenne Chapman Rudolph, Henry James Haver Crissman, Lauren Karle, and Mario Mutis, these artists are an important part of the future generation of ceramic makers. Taking place in Portland, Oregon, an important center for ceramics and socially engaged art as the birthplace of Open Engagement, this exhibition engages with both the local community and the wider ceramic audience. As part of Future Flux, Social Objects will display objects that developed from the lineage of ceramic craft and simultaneously engage viewers in a social experience surrounding the object. The role that potters and artisans play in society has changed, and what we are doing reflects that change. Our objects serve a social function beyond a utility or aesthetic, they have the potential to share interactions, create experiences, and build community. As ceramists we celebrate the legacy of our relational while staying at the forefront, continuously asking how we can, as artists, engage our community in significant ways.